Home » Cheltenham » Champion Hurdle Tips & Odds 2014 : Hurricane Fly or The New One? 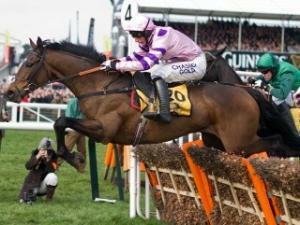 Latest Champion Hurdle Tips and odds form the Cheltenham Festival 2014? Will Hurricane Fly triumph once more? Cheltenham punters are in for a treat with one of the races of the Festival taking place on the opening day as Hurricane Fly, The New One, My Tent Or Yours and Our Conor all do battle in a mouthwatering clash for the Queen Mother Champion Chase. It’s sure to be an eye-catching race and one in which is held with plenty of anticipation. It’s pretty unusual for any sort of festival that provides entertainment that the showpiece of the event takes place on the first day. CHELTENHAM OFFER: £250 FREE BETS + NON RUNNER NO BET! CHELTENHAM OFFER: £25 FREE BETS + BEST ODDS GUARENTEED! CHELTENHAM OFFER: £25 FREE BETS + NON RUNNER NO BET! CHELTENHAM OFFER: £50 FREE BETS + NON RUNNER NO BET! CHELTENHAM OFFERS: £25 FREE BETS + NON RUNNER FREE BET! CHELTENHAM OFFERS: £50 FREE BETS + NON RUNNER NO BET! CHELTENHAM OFFERS: £30 FREE BETS + NON RUNNER NO BET! You wouldn’t go to Glastonbury and be treated to Kings Of Leon before a Beatles tribute act take to the stage. But horse racing differs in that regard. This year’s centre-piece of the Cheltenham Festival will be over by the time the fifth race is run of the entire week. The Champion Hurdle is without question the race that everyone is getting all giddy over with just six weeks to go until the tapes are lifted on the Tuesday. Just the thought of Hurricane Fly, The New One, My Tent Or Yours and potentially Annie Power all rising together at the final flight is enough to send my knees weak. Sometimes these kind of matchups don’t tend to live up to the billing but the sheer depth in quality within the Champion Hurdle ranks makes a boil over incredibly unlikely. Two-time champion Hurricane Fly heads the betting. By landing the 2013 Champion Hurdle, a year after relinquishing it, he joined National Hunt racing greats like Kauto Star, Moscow Flyer and Inglis Drever, all of whom achieved one of the hardest things in racing: to successfully win back a major Cheltenham Festival title. Thus far this season, everything that has been put in front of him he has beaten. First in the Morgiana Hurdle, then in the Ryanair Hurdle and finally when winning the Irish Champion Hurdle. Three races. Three Grade Ones. However, there does seem to be a changing of the guard approaching on the hurdling scene with The New One bringing top-class claims to the table and he may just have the gears to dethrone the great champion. Nigel Twiston-Davies’ charge won the Neptune Investments Novices Hurdle at the festival last season in fine style and has run like a champion in waiting when winning at Kempton and Cheltenham’s International Hurdle before only getting beat by a neck by My Tent Or Yours in the Christmas Hurdle when he completely fluffed the last hurdle. On a course that he loves, he’ll take some beating. My Tent Or Yours goes into the contest unbeaten having won the Fighting Fifth before his Kempton success while Irish challengers Jezki, Our Conor and Un De Sceaux all are very classy on their day. One thing is certain, whoever comes out on top will enter into greatness territory.